Violent extremist organizations (VEOs) operating in Mali remained active and operational in Mali throughout the month of July, especially Ansar al-Din. Attacks conducted in Mali were mainly carried by Ansar al-Din, targeting mostly the Multidimensional Integrated Stabilization Mission in Mali (MINUSMA), and Malian forces. This trend will most likely continue in coming weeks and months in efforts to undermine national and international efforts to stabilize the country. Malian forces suffered one of the deadliest attacks since 2012 when a joint operation by more than one group targeted Malian Army base at Nampala near Mauritanian borders. The incident further demonstrated both the ability of groups to conduct deadly attacks and to demonstrate that Malian Army remains unable to to prevent such attacks. The use of improvised explosive device (IED) remains the main tactic to target Malian and foreign forces, while targeting MINUSMA logistical convoys is in increase with the aim to disrupt peacekeeping operations. Month of July was also bad in regards the implementation of the peace process. In July 12th, demonstrations by local population opposed to the process in Gao turned violent when Malian forces fired at protestors killing 3 and injuring more than 30. In July 21st fighting erupted between in Kidal between GATIA and CMA, two key actors in the Algiers peace accord. Further violent clashes also took place in July 31st indicating that violence and use of arms remain the strong negotiations language. Images of Islamist militants in northern Mali released by al-Mourabitun of AQIM arm media al-Ribat. AQIM branch Grand Sahara announced the death of one of its senior commanders, Abu Bakr al-Shenkiti (Mohamed al-Radhi). This is a major loss to the group because of Abu Bakr’s extensive experience fighting in Mali since joining AQIM in 2009. Malian forces arrested on July 26th Ansar al-Din Macina brigade leader identified as Mahmoud Barry (aka Cheick Yahya). Cheick Yahya reported to have played key role in the Nampala attack, and was arrested between Nampala and Dogofri. He made its first public appearance in a first video released by the same brigade May 18th. Malian forces arrested on July 19th key leader of Ansar al-Din southern brigade, Boubacar Wardogo. Wardogo is from Burkina Faso and was leading Ansar al-Din branch operating along Burkina Faso and Mali borders. His brigade was responsible for number of attacks conducted on both sides of the borders. This arrest was a result of investigations that followed the arrest of Yacouba Touré, another key Ansar al-Din figure in the south who was arrested in May. AQIM claimed 0n July 21st responsibility of kidnapping then assassinating High Council for the Unity of Azawad (HCUA) senior commander at Ber. Commander was identified as Alhassane Ag Intoua, and was taken from Ber on June 20th. Also, AQIM sent decapitated body of MNLA member, Efad Ag Arikak taken at Ber on June 6th. 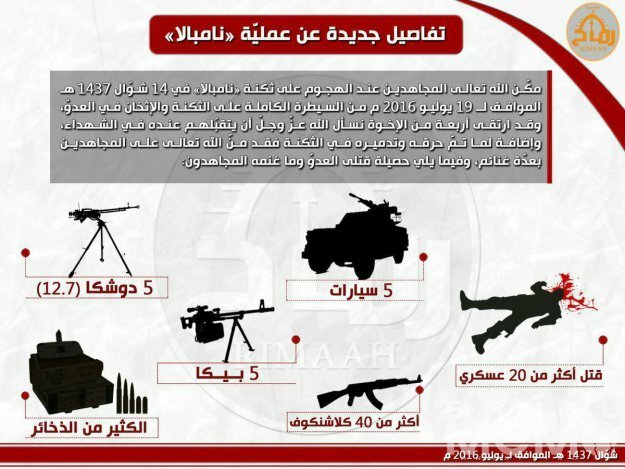 Ansar al-Din media arm al-Rimah released an infographic with statistics of the Nampala attack claiming to have seized 5 (12.7mm) Doushka and 5 PK machine guns, more than 40 AKs, 5 vehicles, and important amount of ammunition. Ansar al-Din inforgraphic with Nampala attacks statistics. 01 July 2016: Unknown armed militants attacked Malian gendarmerie post in Ménaka. 2 killed and 1 injured. 04 July 2016: Malian Army vehicle and two MINUSMA supply trucks struck at least 2 IEDs 30km north of Bambara-Maoudé, then burned. MINUSMA supply truck burned during July 4th attack posted on twitter. 06 July 2016: Three MINUSMA supply trucks attacked and burned by unknown gunmen at In-Bassossotan between Hombori and Gossi. 09 July 2016: Malian security forces site attacked by unknown armed militants at Dinangourou, Mopti region. 2 killed and 5 injured. 10 July 2016: MINUSMA supply truck struck an IED near Tabankort while traveling on Gao – Anéfis transit route. Truck destroyed but no injuries. 11 July 2016: Armed men assassinated Mayor deputy of Ouro Mody, central Mali. 13 July 2016: MINUSMA vehicle struck an IED 2km east of Kidal. 2 peacekeepers suffered minor injuries. 13 July 2016: Malian Army discovered a 5kg IED 7km from Ansongo on the Ansongo – Ménaka route. A civilian passing alerted Malian authorities when initially found the IED. 13 July 2016: A car bomb exploded (30km from Anéfis) as MINUSMA convoy was traveling on Tabankort – Anéfis transit route. 1 MINUSMA sub-contractor and 3 peacekeepers injured. 14 July 2016: MINUSMA armored vehicle struck an IED while escorting UN police (UNPOL) patrol mission in Kidal. No casualties. 14 July 2016: Unknown gunmen on motorcycle fired their weapons at fuel tanks parked at a gas station in Gao. Fuel Tanks were fortunately empty. 19 July 2016: Militants carried an attack on Nampala Army base. 17 soldiers killed and 35 injured, while 4 militants also killed. Important amount of weapons seized by the attackers as well. Ansar al-Din Macina brigade and non-jihadist new group ANSIPRJ claimed the attack. 20 July 2016: Malian and French forces discovered and destroyed cases of grenades, ammunition, and rockets in Gao. The discovery occurred at N’Jawa neighborhood, and according to a local witness the area was important hideout for Islamist militants during the occupation of Gao in 2012 by the Movement for Unity and Jihad in West Africa (MUJWA). 20 July 2016: Unconfirmed reporting about an attack on Malian forces at Gatiloumou, Youwarou commune, central Mali. An area where Ansar al-Din Macina brigade is operational. 21 July 2016: Unidentified gunmen attacked CMA checkpoint at Timboukri, 30km of Ber, Timbuktu region. 7 killed, 1 injured. 3 MNLA members were initially taken before being allegedly executed by AQIM then sent to Ber along with the body of 2 CMA members taken on June 6thand June 20th. 30 July 2016: Malian Army vehicle struck an IED then ambushed between Gossi and Hombori. 2 Malian soldiers killed and 5 injured. 12 July 2016: Youth protests against Malian authorities and the implementation of the peace process turned violent. 3 protestors killed and more than 30 injured. 18 July 2016: Violent clashes occurred between GATIA and Ganda Izo at Gossi. 3 Ganda Izo fighters and 1 GATIA fighters killed. 19 July 2016: Argument between CMA and GATIA members turned violent. 1 killed and 1 injured CMA fighters, and 1 GATIA fighter killed as well. 19 July 2016: Members of GATIA and CMRFP2 clashed at Didi under unclear circumstances. 1 CMRFP fighter killed. 21 July 2016: Violent clashes erupted between Gatia and CMA forces at Kidal. Reportedly, at least 20 killed and more than 40 wounded. 30 July 2016: GATIA and CMA forces clashed at Edjerer, a location 50km northeast of Kidal. GATIA secretary general said they killed at least 6 CMA fighters. 11 July 2016: Unknown gunmen attacked merchant vehicle at Taoussa traveling from Timbuktu to Bourem. No casualties but several were injured. 17 July 2016: Gunmen attacked a merchant and his companion at Tassiga, near Ansongo. Robbers seized their motorcycle and killed the companion.